Queens Hospital chose to utilize offsite construction for their new Heal 11 building, located adjacent to their existing Ambulatory Care Pavilion, to mitigate onsite disruption and to reduce construction traffic and related risks. 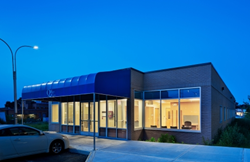 The Modular Building Institute would like to recognize members of Axis Construction Corp. and manufacturing affiliate NRB, Inc. for their work on the June 2015 Modular Building of the Month, Queens Hospital Center Heal 11, located in Jamaica, New York. Built near an existing hospital facility, this 5000 square foot project needed to be completed on time with the least amount of site disruption possible. Permanent modular construction was chosen to keep disruption to a minimum while meeting the stringent New York City building codes and Department of Health regulations. The Heal 11 building features the right mix of architectural, mechanical, and electrical features while still maintaining strict adherence to budget requirements – critical to the success of the project. NRB, Inc.’s unique “build-together” process shortens on-site installation time, as it ensures precision fit and finish at the plant before being deconstructed for transport. This process also allows the building to arrive with all the exterior brick installed, as well as a high level of interior completion, further reducing time spent onsite. The design features few interior columns to allow for maximum use flexibility. It also uses high-efficiency, energy saving interior light fixtures with occupancy sensor controls in all rooms, low VOC paints, and high-efficiency natural gas HVAC units for energy savings. Axis Construction Corp. received an honorable mention in the Permanent Healthcare category in MBI’s 2015 Awards of Distinction, presented at their annual convention, World of Modular, held March 2015 in Las Vegas, Nevada and is an excellent example of effectively using modular construction for a permanent healthcare facility. The Modular Building Institute is the international nonprofit trade association that has served the modular construction industry for 30+ years. Members are suppliers, manufacturers and contractors involved in all aspects of modular projects -- from complex multistory solutions to temporary accommodations. As the voice of commercial modular construction, MBI expands the use of offsite construction through innovative construction practices, outreach, education to the construction community and customers, and recognition of high-quality modular designs and facilities. For more information on modular construction, visit http://www.modular.org.